An arty riad filled with British modern art and Moroccan collectables. Stunning suites and spectacular views, spa treatments and belly dancers plus unbeatable food- what more could you want? All children are welcome. Babysitting on request. On request El Fenn will organise belly dancing performances. Cooking classes start at the market to buy fresh local ingredients and learn the history of the food. 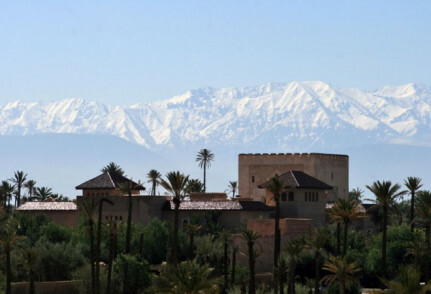 Take a guided tour through the souks and medina of Marrakech and explore what this vibrant city has to offer. The Riad overlooks the famed Kotoubia Mosque, which is five minutes away. El Fenn is a creative, laid-back, home-style kind of hotel. Guests don’t come here for valet parking and a room filled with technology. But if they want a great room, great food, great company and attentive staff then they do. A short (3 minute) walk away is Djemaa El Fna square and the Koutoubia mosque. Exploring the city is easy because all the sites of the medina are within easy walking distance (El Fenn can organise a guide). Visit the beautiful Koranic college Ben Youssef Medersa, the ancient Jewish quarter with its maze of alleyway and of course the world famous souks, which are filled with everything from metal workers, dyers and basket weavers to tradesmen selling olives and spices. The bars and restaurants of Gueliz, Hivernage and the Palmeraie can be reached by taxi. The day starts at El Fenn with a cafetière of coffee and pot of tea left outside each room. Then breakfast is usually served on the roof terrace - here enjoy a breakfast of delicious homemade yoghurt, muesli and cinnamon porridge, breads, pastries, fresh fruit and eggs cooked to order, complete with sunshine and a view of the Atlas Mountains. Yes - El Fenn is passionate about food, and lunch and dinner menus offer the best of traditional Moroccan food as well as more European dishes. By noon, the chef has chalked up the day’s set Moroccan lunch menu which changes according to what’s in season, or guests can pick a dish from the light menu that runs until 6pm, expect a range of salads and meats. Later on in the afternoon, enjoy a refreshing glass of mint tea and plate of homemade patisserie when afternoon tea is served at 4pm in the main courtyard. Dinner is a la carte, and on warmer evenings is served under the stars on the roof terrace (or in the restaurant in winter) - sample dishes may include Bouillabaisse, Tangia (traditional Marrakchi beef stew) and grilled lamb chops. Room 19 is the most popular, it’s a Plunge Pool Suite and El Fenn’s most romantic room. El Fenn’s 2 and 3-bedroom private houses are perfect for families looking for their own space. Cots are also available and babysitting can be organised on request. 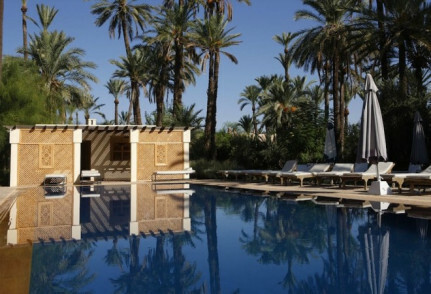 This Marrakech riad offers art-house rooms with wow-factor, an exceptional buffet breakfast and a courtyard pool shaded by palms.